Okay, everyone. It's that time of year, the 2nd day of May which means the Met Gala was last night and I spent the entire evening aflame with gasps and opinions. I've been excited about this Met Gala since the very moment it was announced that Rei Kawakubo and Comme des Garcons would be the theme. I absolutely love R.K.'s work and hoped with fingers crossed that some fashion girls would do it justice. As it happens every year, about half of the gala attendees totally ignored the theme but there were plenty who went along with it and pulled it off with amazing results. At the beginning of the evening, I insisted that Eva Chen had the best look of the night but now I can safely say she is tied with Rihanna for best look. Far and away, these two were just about the most spot-on interpretations of Comme des Garcons. UPDATE 2/2 at 7:00 PM: I just saw Anna Cleveland's look and OMG, yes. This is exactly what I wanted to see. A true ode to Comme des Garcons and clearly so much love for Rei Kawakubo. Other favorites, of course, included queens MK and Ashley Olsen who look more like vampiric goddesses with each passing year. Rick Owens and Michele Lamy unsurprisingly went full out with incredible, edgy looks and were clearly the most direct interpretation of Kawakubo's work. 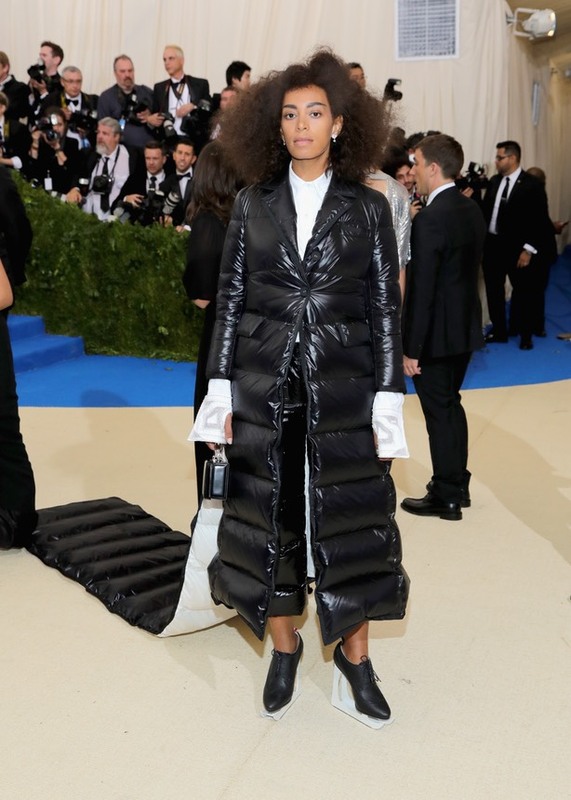 I also loved Solange who, instead of going the red route, seemed to be inspired by the CDG Fall 2014 show with its textured, puffy jackets and wore Thom Browne. I adored Stella Maxwell in her white, fringed dress. As usual, Karlie Kloss opted for a clean look that worked surprisingly well for this theme. I absolutely love her chic platinum bob, too. Mandy Moore always looks beautiful but I wasn't expecting her to go in an uncharacteristically edgy direction. The slicked back hair and heavy eye was perfect with the dress. Speaking of edgy, I loved Grace Hartzel's approach with the sculptural suit and dramatic makeup. This is exactly why I looked forward to this year's gala. While Doutzen Kroes may have chosen a relatively simple look, she always looks incredible and I love the way she balanced a natural hairstyle with a red, voluminous dress. Like Grace Hartzel, Rila Fukushima went for a doll-like look that was perfect for the occasion. I loved seeing a mini dress in a sea of gowns. Sort of like Doutzen, Allison Williams had a simple take on the outrageous theme, adding a little sculptural element to a simple white gown. I thought that Rose Byrne did a great job choosing a look that really works with the theme but also fits with her own personal style and Lily Collins impressed me, as always, with a goth princess look that wasn't super cliche. Gigi Hadid looked incredible as always. Even though I don't think it necessarily fit the theme, I don't care because the girl looks like a goddess. I didn't love Sasha Lane's shoes, but the dress was very cool and the look reminded me of something Zoe Kravitz would have worn a few years ago. Finally, I have to give a shout out to Migos for being the only men I saw who ventured away from the traditional tuxedo yet still looked cool. As for what I would have worn to this year's gala... I love the idea of a sculptural look but I would've gone all white. I love this incredible gown from Markarian paired with white Maison Margiela boots inspired by the Spring 2012 show. 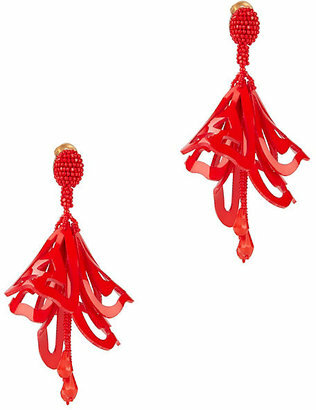 To celebrate Kawakubo's iconic red, I'd wear sculptural, red earrings from Oscar de La Renta. The makeup would be a clean, nearly bare face with a cropped, warm gray bob like this. All-in-all, I thought there were a lot of great looks this year but Kanye was sorely missed. I wanna hear about your favorite looks! Who were your favorites?